We've all heard the stories: Guy finds a painting in his attic, has it appraised, learns it's a long-lost Picasso, sells it to a collector for zillions. Hope springs eternal. But these stories aren't all urban legends. There's enough stuff out there that you just never know. My colleague Zac Bissonnette wrote recently about the German woman who pulled a million dollar painting out of the trash. The chances of finding a lost master at a garage sale are slim, but that doesn't mean there isn't plenty of high-quality art out there. And I'm not talking in the galleries, either. In one sense, art is where you look for it. In another sense, everyone's an artist. Find what you love, and go from there. Here are a few places I've hit pay-dirt when trolling for art. Thrift stores - Along the lines of "you just never know," it's always smart to flip through the stacks of badly-framed kitten posters and mass-produced clown prints. You just might find an image you love. In the early '90s, I found the above image in a run-down thrift store (really more of a junk shop) in the Bowery in New York City. I pulled it out of a pile, attracted by its obnoxious colors and striking face. The guy wanted $10. I dickered him down to $3. I've always suspected it might be a rogue Peter Max, because of the subject matter and the just barely illegible signature on the lower right hand side. 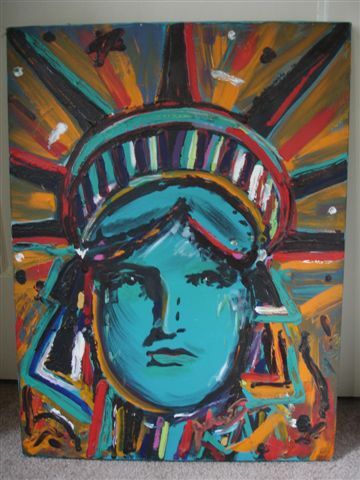 Collectors pay thousands for Peter Max pieces. Could mine be one? Who knows? Probably not. But I love the idea that it could be. And in the meantime, this loud, $3 painting has become one of my favorites. "urban ore" stores -- I don't know what else to call these kinds of places - it's where somebody else's junk goes to die. There, amidst the boxes of Grandma's old photographs and computers from the '80s lurk artwork forgotten. I found a whole box of small painted "studies" by noted Bay Area artist Lin Fischer, pieces she apparently thought were junk and tossed. I didn't love all of them, but for $5, I took them all home. They've since been some of my most loved pieces. Estate sales -- Sometimes you can find gems, especially if the estate sale operators aren't too savvy. It's always worth going in and looking, because you just never know if that old lady partied with the Bay Area Expressionists back in the day and had a few studies by Richard Diebenkorn locked away in a trunk. Street faires - I found some of my favorite potters at local art fares over the years. I've been following the sublime Nichibei potters for years, after stumbling upon them at a street fair in Palo Alto more than 20 years ago. I've never found much in the way of paper media at street fairs (too often it falls over the line into decorative, which I'm not big on), but for finding the works of craftspeople and artisans, street fairs can't be beat. Student shows - Most MFA programs mandate at least one showing of artwork to graduate, so your chances of finding an artist in the making are good. Yes, you'll have to look at a lot of embarrassingly bad art and eat a lot of cheese cubes and crackers. But you'll also meet some young talent who will be thrilled with your patronage now and cut you friend breaks down the road when they're represented by real galleries. Museum rental gallery shows. Every year the San Francisco Museum of Modern Art Rental Gallery hosts a 50% off sale, where you can buy work from its stable of established Bay Area artists for half off. I would go with painter friends and rely on them to tell me what was hot, picking up pieces I didn't even necessarily love, just because the price was so good and the artist was a noted up and comer. Ebay. I don't have a lot of experience with art on eBay. The few times I've been interested in a piece, I've been outbid at the last minute. I just don't know how the auction process works well enough to nab what I love online. But it's a rich source that's worth being plied. In the next installment, I'll look at when -- and if -- you should invest in framing your artwork.